3D Touch is a pressure sensitive feature found in iPhone 6s and newer. This feature allows you to apply different amounts of pressure to the screen display to make use of the Peek and Pop actions. These actions allow you to preview content and execute commands from your iPhone 6s/6s Plus device without having to fully open an application. To learn more about 3D Touch, Peek, and Pop, please see Take Advantage of 3D Touch. As of BeyondTrust Privileged Remote Access 16.1, you can use 3D Touch to easily access Jump Items. Please see the sections below to learn more about the different ways that 3D Touch allows you to quickly access your critical systems. Using 3D Touch, you can quickly access up to three of your most frequently supported Jump Items from the iPhone Home display. Follow the steps below. 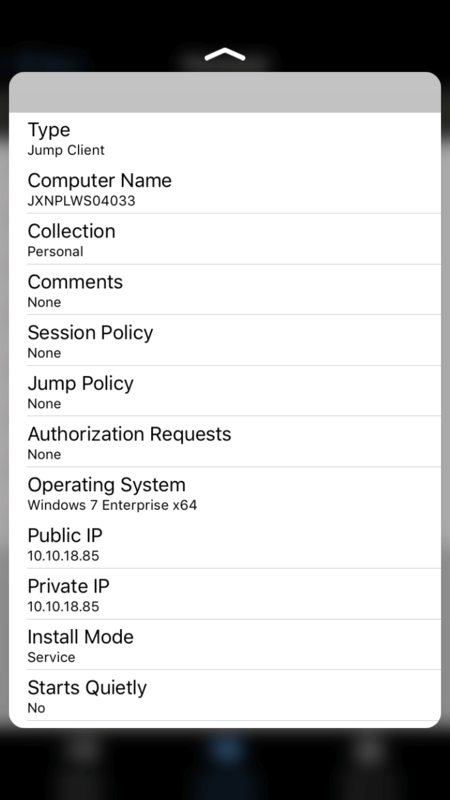 Press and hold the iOS mobile access console app icon, and a list of your frequently accessed Jump Items appears. Note that you will have to apply extra pressure to the screen to see the Jump Item options. A session with that Jump Item is iniated. 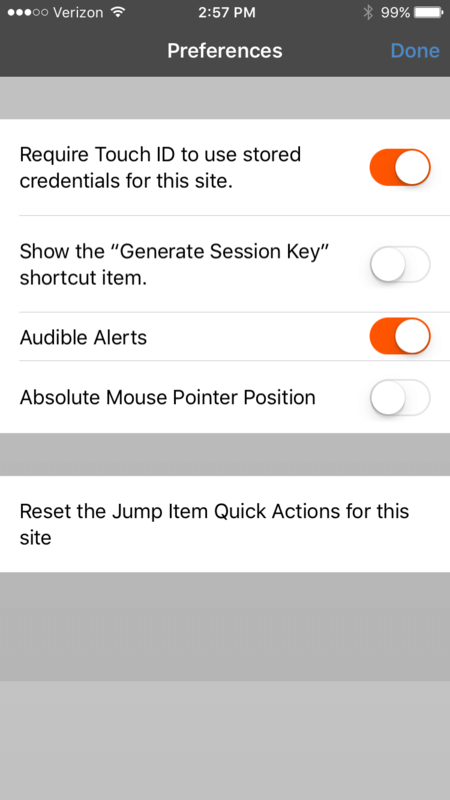 To view Jump Item details before you launch a session, you can use the 3D Touch Peek and Pop actions. Follow the steps below to preview a session. From the Jump Items page, select the queue where the Jump Item is located. Once you have tapped the queue, a list of Jump Items appears. Tap and lightly press on your selection until the Jump Item's information comes into view. While continuing to press on the screen, swipe upward to see the Jump action. Click Jump to initiate a session. While in the iOS mobile access console, access the preferences menu by tapping the hamburger icon located in the top right corner of the screen and selecting Preferences. In the preferences, Reset the Jump Item Quick Actions for this site is specific to 3D Touch. When tapped, this preference allows you to clear the frequently used Jump Items list found when tapping and holding down the iOS mobile access console app icon.